A new measurement option for the R&S FSW signal and spectrum analyzer from Rohde & Schwarz allows developers to optimize the EMI performance of their products as early as in the design phase. This saves valuable time on the way to final EMC certification. R&S FSW high-end signal and spectrum analyzers are typically used in the development labs of aerospace & defense companies as well as in the telecommunications and automobile industries. To better serve all these users, the new R&S FSW-K54 software option supports EMI bandwidths in compliance with commercial as well as military standards. In order to analyze disturbances, the option contains EMI detectors such as peak, quasi-peak, CISPR-average and RMS-average in line with CISPR and MIL standards. It also includes a database of predefined limit lines as specified by international standards, as well as correction factors (transducers) for typical measurement tasks. The limit lines and transducers can be modified to match the customer’s requirements and EMI accessories. The EMI option allows users to optimize shielding design features (e.g. in devices or components) making it easy to test how design and circuit modifications will affect EMI performance. To reliably capture all disturbances, the R&S FSW uses a high maximum number of sweep points – 200,001 -- for this application. Up to six traces with different EMI detectors can be active at the same time. A maximum of 16 separate markers analyze any disturbance that may be present. The instrument displays measurement results on either a linear or logarithmic frequency axis. The spectrum display using a logarithmically scaled frequency axis makes it easier to diagnose results and also allows limit lines to be displayed in conformance with standards. Amplitude- and frequency-modulated signals can be demodulated using markers. They are then output to speakers or headphones via the audio channel to help clearly identify disturbances. The new R&S FSW-K54 EMI measurement option for the R&S FSW is now available from Rohde & Schwarz. 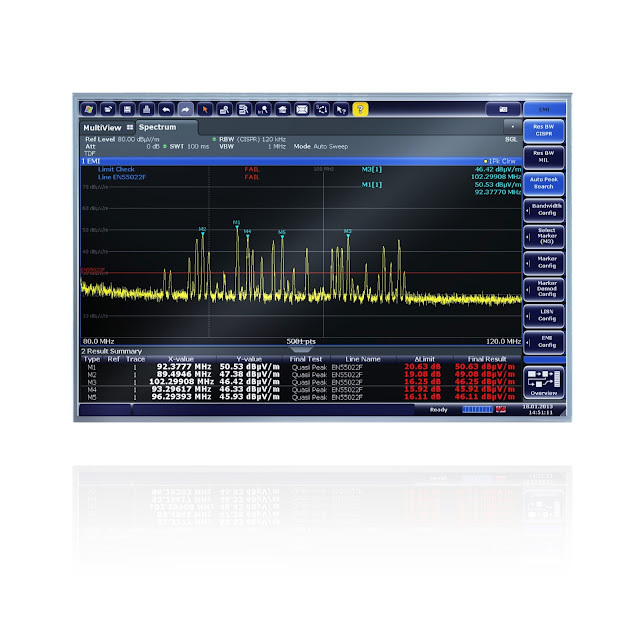 The high-end spectrum analyzer comes with several other options for measuring RF parameters and analyzing digitally modulated signals such as LTE, WCDMA and WLAN. For detailed information on the R&S FSW and accompanying options, visit www.rohde-schwarz.com/product/FSW.